The race schedule will be published a few weeks prior to the event. Individual Sprint (part of the Olympic programme): Qualification 200m time trials are followed by knockout heats of 3 laps that select the best two riders to line up against each other in the final. Riders sometimes come to a standstill to make their opponent take the lead – the least advantageous position before the final sprint to the finish line. Team Sprint (part of the Olympic programme): This is raced by teams of three over three laps of the track (for women, two riders over two laps). Two teams start on opposite sides of the track, with each rider leading for a lap before peeling off. The final remaining rider for each team sprints for the finish to establish the team’s time. Kilo (or 500 m for women): Two athletes ride simultaneously during qualifications with the 8 fastest going through to the finals. The finals are raced as an individual time trial from a standing start. The competitor with the fastest time is the winner. Keirin (part of the Olympic programme): Riders follow in the slipstream of a pacing motorbike for 750m before undertaking a three-lap sprint to the end. The motorbike gradually increases the speed from 30 to 50 km/h before pulling off the track to allow the sprint to begin. Individual Pursuit: Two riders start on opposite sides of the track and compete over 4km (3km for women). The winner is the rider who manages to catch his/her opponent or who records the fastest time. Team Pursuit (part of the Olympic programme): Two teams of four riders start on opposite sides of the track and compete over 4km. The winning team is the one that manages to catch its opponents or that records the fastest time. Points Race: This is a bunch-start race of around 25km for women and 40km for men. Riders can gain points during sprints (one every 10 laps on a 250m track) and by lapping the rest of the field (+20 points). The final result is calculated according to the number of points won. Points awarded in the last sprint after the full distance are doubled (10 points, 6 points, 4 points, 2 points). Madison (part of the Olympic programme): Teams of two riders take part in this relay race contested by means of intermediary sprints (every 10 laps). While one team member races, the other slows down to take a rest before being thrown back into the action with a hand sling from his/her team mate. The classification is calculated according to the number of points won. As with the points race, any team that gains a lap on the main bunch is awarded 20 points, while any team that is lapped by the bunch has 20 points deducted. Points awarded in the last sprint after the full distance are doubled (10 points, 6 points, 4 points, 2 points). Scratch Race: This is a mass-start race for individual riders over 15km for men and 10km for women. The first lap is neutralised. Omnium (part of the Olympic programme): Formerly made up of 6 events disputed over 2 consecutive days, this year the Omnium will comprise four endurance events raced on the same day: Scratch race, tempo race, elimination and points race. Riders must show consistency throughout the day to have a chance of topping the final classification. Results and start lists will be available here. The event will be live-streamed. More details to come. A concession stand will be available on the Spectator level providing light meal options, snack items, hot drinks, cold drinks, and wine. Beer will also be on sale from two local event partners. Cash and credit will be accepted. We have found all our volunteers for the 2018 season. Thank you for your interest! 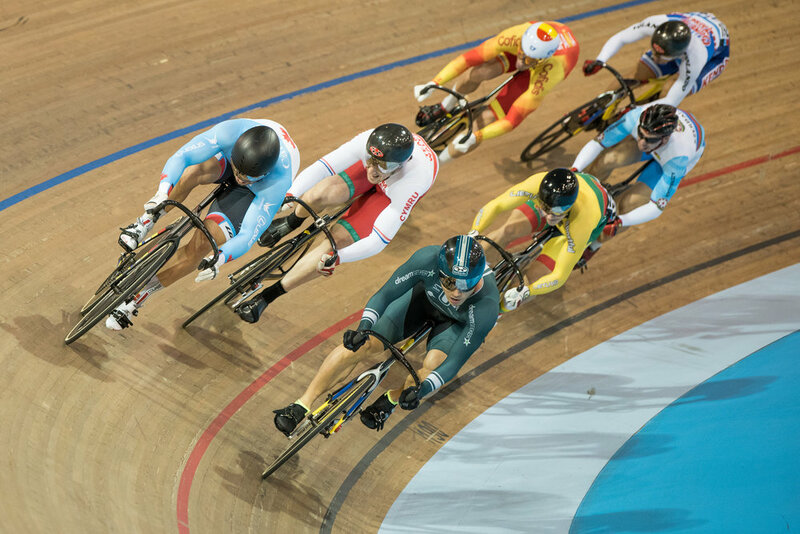 Applications for media accreditation for the 2020 Tissot UCI Track Cycling World Cup in Milton will open in the Fall of 2019. For any media inquiries, please contact karine.bedard@cyclingcanada.ca. If you are interested in learning more about our corporate packages, please contact matthew.jeffries@cyclingcanada.ca.